DP: An Sonjae, you weren't born in Korea, you were born in Cornwall, England in 1942, can you remember when was the earliest time in your life that you heard about Korea? AS: [laughs]. Well, I'm not sure. I mean, I was old enough to be conscious at the time of the Korean War [1950-53], and we used to listen to BBC news at home of course, so … one had heard of the Korean War and of course nobody heard anything after that … but by the time you got into the 1970s, it depended on what newspaper you read. Korea figured in The Guardian and Le Monde from early on – you know 'une dictature musclée': [tough] stuff. So in the Taizé community from quite early in the 1970s at least, we knew Korea existed and we started to have contacts with people, either brothers visiting Korea itself, or Korean people coming to France. DP: What was the idea when you first came to Seoul? Were you on a mission? AS: Yes. Well, I went from Taizé to do work in the Philippines early in 1977. Later that year our Prior, Brother Roger, the founder of Taizé, met the Catholic Archbishop of Seoul, Cardinal Kim, in Hong Kong. And during lunch he said 'Well, can't you send some brothers to Korea?'. And Brother Roger said 'Oh, we don't have enough brothers' [laughs]. But anyway, in late 1979, just after the assassination of [former President] Park Chung Hee, a couple of brothers came to Korea, and I joined them in 1980. DP: And can you describe for me what kind of place Korea was in 1980? AS: But, of course, this was at the end of the 1970s. The 1970s had been a period of industrialisation and urbanisation. if you crossed over the Han river to Yeongdeungpo [near the site of the present day National Assembly building], that whole area of Gurodong, Garibong-dong – it was all factories, real working-class. You can't imagine that now, it's completely changed  there were sweatshops, and virtually no subway, and everyone got around riding packed buses. There was no traffic apart from taxis and buses and trucks, no private cars. And so the buses went screaming down the highways and to get everybody on the buses there were these little girls who'd come up from the countryside with absolutely no qualifications or anything. Their job was to push people onto the buses. In those days you got on in the middle and had to get out at the front, and the girls in the middle were pushing, pushing people while receiving money and giving change. Well, that lasted a few years and then they got rid of that. DP: I guess it's almost a cliché to say that things have changed but you must have seen some extraordinary changes in that time. Did you have any culture shock when you first arrived? Were you shocked by anything? AS: Oh no, I'd spent three years in a Filipino slum. This was luxury. DP: Okay, so you came prepared. 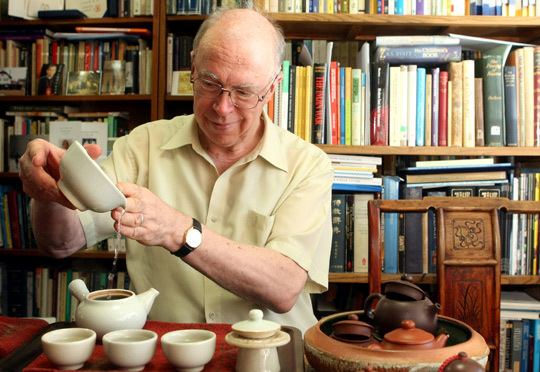 An Sonjae prepares a pot of Korean green tea, a pastime about which he has written a book, together with Hong Kyeong-Hee. Image courtesy of An Sonjae's website. DP: How long did it take you to become proficient in speaking Korean? AS: I'm getting [better] now. Korean is tricky, it's not easy for Koreans to teach Korean; Koreans have a very hard time imagining what non-Koreans difficulties may be; they can't really imagine it. In those days, the textbooks were written by linguists who had no real idea of what people would need. There was no attempt really to introduce a systematic vocabulary  it was like 'you're supposed to know the words!'. Anyway, so I went through the course step by step, right through, and then you just go on living. I didn't have much to time to do homework, because I had to teach and earn our living, as we don't accept gifts or donations. DP: Tell me about your teaching at Sogang. AS: Well, I met the Jesuits here at Sogang, and one of the priests knew about our community in France, and he said 'Oh well we need somebody to teach French, basic French, and you speak French don't you?' And I'd had maybe ten years in France so I began to teach French lab and then after a couple of years a French department began [at Sogang] and I said 'Well, really I'm not a French native', and so I went over to teach general English for a couple of years. Then the English department said 'You studied medieval literature, could you teach Chaucer?' So when I moved into the English department I went to the University president and said, 'Look, I'm earning a lecturer's fee but it takes all my time to prepare these classes I'm teaching at graduate school, what about something a bit more permanent?' In those days, it was a little easier than it might be now. DP: Was that something that you expected to happen when you came here? DP: I mean, did you expect to become a Professor? AS: Oh dear me, no! I said I'd never teach. DP: Do you enjoy teaching? DP: They have good things to say, yeah? DP: If you had to characterise the Korean tertiary education system, how would you describe it? AS: Oh, deadly. You see, I mean, Koreans whose children happen to be studying in England – even in the sort of ordinary public schools – at fifteen they're already writing 2,000 word essays, and expressing their own opinion and discussing Nietzsche and Schopenhauer by the time they're sixteen, and reading Molière or whatever. On the other hand the Korean system, like the Japanese system, is designed to stifle creativity, imagination, curiosity, initiative, whatever. 'Memorise and repeat, memorise and repeat'. And of course parents don't help, mostly. There are now special schools where children are taught to debate and write analytical essays, but it's not part of Korean natural culture. It's not 'what Confucius said'. DP: [laughs] In your opinion what place does literature have in Korean society? AS: Well, now it's the same everywhere. Korea once had that idea of literature as conveying value and vision, but now you're fully into the television generation. So, it's normal that the whole literary dimension has changed and it's much more related to entertainment, less related to life, value systems, or philosophy, history. I mean, Koreans, you see, up until 1987, were very conscious of being in a historical process aiming at democratisation, and were aware of the role of students as the conscience of the nation, the guguk [saving the nation]. So, it was a very different kind of Korea, really. No Starbucks. DP: No, haha! One thing that I'm very interested in, and in some ways it's a very over-used cliché, but it's this idea of Korea as a 'hermit kingdom', traditionally. Do you see that as something that is still present within Korean society? For example in the way that Koreans engage or don't engage with literature from outside Korea? Do you think there is still a strong sense of 'this is our literature, our culture, and we've got a wall around it, we'll let you in if it suits us'? AS: Well, it's different, because Koreans have a very low opinion of their own culture and they don't want to know it. Nobody wants to live in a Korean house, nobody wants to hear Korean traditional music, nobody can write Chinese characters, virtually. I mean there are exceptions but traditional culture or really Korean identity-culture is absolutely dead. Foreigners are much more likely to be fascinated by it than Koreans, with exceptions. And in that sense, I think well the Koreans probably learnt that originally from the Japanese. The Japanese were more complicated, because Meiji told the Japanese that modernity was the future, and that they had to change; but at the same time Japan has so far preserved its traditional culture more than Korea has, although again there is a great deal of loss. But Korea is an island. It was a peninsula, but the northern frontier is not exactly a seething hub of civilisation beyond Manchuria and Siberia, so it's pretty much an island, always has been. While Korean culture cannot be imagined apart from China, South Korea was colonised by Japan and then by the United States … [pause] in many ways. Korea was very, very poor after the war  there were very few foreigners coming to Korea, there are more now, of course, but it is very difficult for Koreans to understand and really sense how non-Koreans live, I think. And the psychology of the uri' mentality  the 'us', is particularly pronounced. This is despite the fact that Korea has been through a lot of interruptions – it's intensely fragmented, with no continuity. An Sonjae in Kwachon. Image courtesy of An Sonjae's website. DP:That's a great answer, thank you. But of course, I guess at the same time there is still a sense, even amongst a small group of people [in Korea] that poetry is worth writing, you know – that literature is worth writing. And of course this is the million dollar question but who, for you, have been the most significant poets of the twentieth century in Korea? AS: Oh dear, oh dear, oh dear! DP: You knew I was going to ask you this one! There are no wrong answers, I don't think. There are so many poets, and I've translated a few of them, and I'm in no position to go ploughing through dozens of volumes. I can't read Korean poetry, that's why I translate, because I can't read it otherwise. I didn't study. I mean, Kevin O'Rourke, the Irish translator, he did a doctorate in Korean literature, at Yonsei; and Bruce Fulton did a doctorate in Korean literature at Seoul National University, so it's different; they've read a lot, and been taught Korean literature from a Korean perspective, which I have not. AS: You see, I started by chance, almost, because I said to a professor in the English department that well, maybe I should try translating some Korean poetry because I was teaching poetry, English poetry, and I'd seen a few Korean poems. And she said, 'Oh, well I know this Ku Sang, we were together in Hawaii', so that's how I started with Ku Sang. And actually Korea doesn't have a Times Literary Supplement or New York Review of Books, there are no book reviews, no objective book reviewing  but you have a kind of literary establishment, you know, famous critics. On the whole, at that time, in the late 1980s Ku Sang he was a good guy but his poems, his poems, the critics didn't think too much of [them] because mostly they were too simple, he didn't try to be poetic, he didn't really make it a hobby to create new poets; in Korea you're not a poet until a poet says you are a poet. You have to be recommended for publication. I suppose he had done and he had been but most of the time he wrote because he felt like it. He'd been a journalist, and had had a hard time because he was a Catholic journalist … so actually he was in PEN and that, everybody knew him, and he was a nice guy, a bit of a bohemian as writers always were … so I translated three or four books of his. And I think the critics then thought 'Oh, Ku Sang's been published, in England! Perhaps he is a poet'. I'd made him more famous in Korea than he'd ever been! So then, So Chong-Ju  another professor, was the poet. He was an odd guy, obsessed with power, his own power, but then all this kow-towing to powerful people, he really made a career out of it. He was innocent really, he just didn't know anything. His earlier poems were immensely important for Korean people  you know, from 1936-38, 1940-45  and he then became the leading poet, he was powerful and he was well in ; he was for a time in charge of paper supplies, so if you had a collection you wanted published, you had to be in with him, because he was the one who gave that paper to the publisher. DP: Right, talk about a gatekeeper role! And then while I was still doing Sojung Ju, up comes the name Ko Un, and I thought 'that's interesting', so I started on Ko Un, and did quite a bit of that … and then there were others, Kim Kwang-kyu, he's different, he first of all translated German poetry, Brecht, and Gunter Eich, Heine, and then he started writing Korean poetry, saying 'I can't write Korean poetry like Korean poets; I don't like Korean poetry'. So his poetry was completely different, much more ironic, sardonic, satirical, humorous – good. AS: The poetry that Koreans admire is mostly the poetry they're told to admire in school, and it has to be short and poetic, but the poetry which one can translate has to have content, not language, not shiny language, not poetic [language] because it's precisely that kind of poetic that gets lost, so you have to have content, and the content means experience, and then drawing conclusions, whether moralistic or whatever, that's why Shin Kyong Nim and then Ko Un's Maninbo [Ten Thousand Lives]  poetry that is rooted in Korea's historical experience  that's what really has most impact when it's translated. Not language poetry or lyrical poetry  it's virtually never translatable. Kevin O'Rourke tries to do it but he takes liberties; he makes Korean poets sound like Irish poets. 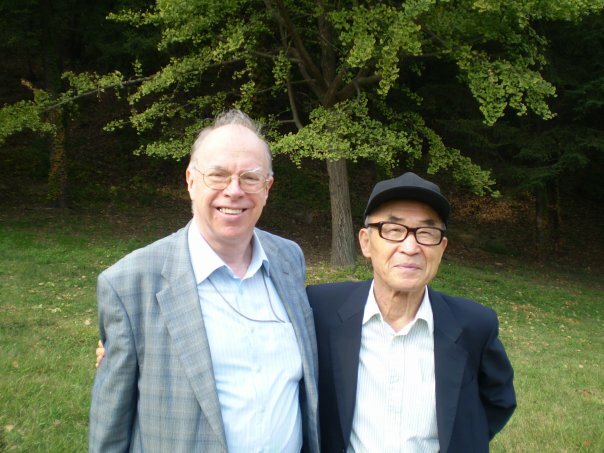 An Sonjae (left) with poet Ko Un. Image by David Prater. DP: I guess you would have been one of the first people to translate that work, in its early chapters, the early parts, is that correct? AS: So The Sound of My Waves had poems from those first three which in a way are some of the most appealing because they're poems about his early childhood, about village life, about old Korea, and family  there's lots of tragic stuff but it's very fresh and very spontaneous, all sorts of vignettes, such as [the ones called] 'No More' and 'No More's Mother'  why is this girl called 'No More'? Because her mother's already had three daughters, and this is the fourth daughter, and so [cries] 'No More!' Where is the son? It's a very common Korean drama, you know; 'I'll divorce you and get another wife who'll give me a son', you know … but then it switches because No More's mother makes this extraordinary pepper paste (gochujang) that everybody loves; so they're these vignettes; each poem is complete in itself, they're very lively. But now he's published up to Volume 26 and his publisher has now got the last four volumes, and so Volumes 27 to 30 are to be published next year  big party!! AS: Yes, and there's a selection I also translated, from the first ten volumes, which are still pretty early on, but then of course when you get to somewhere around Volume 16 or 17, which are Korean War poems, and they're a bit repetitive because everybody dies and ah, yes, he gets raped, or whatever … but we'll see. DP: Do you notice that there is a change in the style of the poems? AS: Well, Ko Un doesn't have style, he just has poems, you never know what the next one's going to be like  a long, or short one  and he doesn't revise what he writes, he just writes and writes and writes … and he doesn't use a computer. But there are already people starting to write doctoral dissertations on little details from it. AS: Oh everybody has heard of him, but it doesn't mean that everybody has read his poems, and it doesn't mean that everybody who's read his poems likes him  but he's also not just a poet … that has to do with politics as well, because he was, in the 1970s and 1980s, a really visible dissident, so a lot of people know him in that context; and like anybody else who's public in Korea he's surrounded by controversy. Korea's a nasty, vicious society, it's always back-biting. 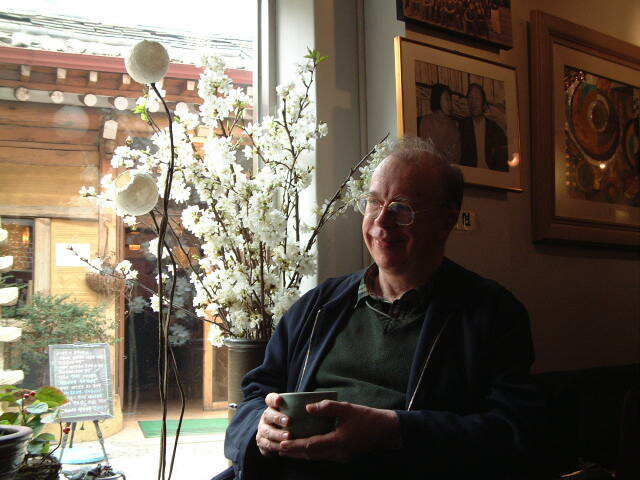 Someone like Ko Un  he doesn't make any attempt to curry favour, you see he doesn't like stereotypes, so when the period of activism was over, when you come into the period of democratisation, in about 1990, what you see is that he stops attending all of these demonstrations and writing protest poems, and he goes back to writing Zen poetry, the Buddhist novel, Little Pilgrim … [and people said:] 'Buddhism? Traitor!' And then of course he becomes an iconic figure and there [at the Inter-Korean summit in 2000] you have Kim Dae Jung and Kim Jong Il on either side and Ko Un is standing in the middle! DP: Yes, it's an extraordinary photo isn't it? AS: What's he doing there? AS: Actually it was total chaos, because they'd signed this agreement, 'The Accord', the journalists said, 'well what about us?' because they'd signed it in a back room out of sight, and so they had to have a photo opportunity, some sort of a celebration. And somebody said to Kim Dae Jung 'Ko Un's written a poem', because he'd been commissioned to write a poem about Pyongyang, or the Taedong river, so they had to improvise this 'thing' for the journalists, and Kim Jong Il also said it was okay, but it was really just chaos and improvisation. AS: Yes but then again, I guess, the whole of conservative Korea can never forgive Kim Dae Jung, and therefore Ko Un, for having done it. DP: So he has an impact on people in any case, regardless of their opinion of him? AS: But Ko Un is an extremely, intensely – what shall we say  individual person. He does not have many friends. In fact I doubt if he has any friends. Very tricky … he has a wife, who is his manager and secretary. DP: Right. He sounds like an interesting guy, it would be wonderful to meet him one day. DP: He's seen a lot of the history of Korea, that's for sure. As a final question, now that you're a naturalised Korean citizen, I guess you have just as much of a stake in the future of Korea as any other Korean person. What's your view on the situation between North Korea and South Korea? Do you hold hopes for a peaceful reunification of Korea? I don't know … I mean, what is in the North is infinitely more fragile, potentially, because it's not like anywhere else. I mean, South Korea is in many ways like everywhere else  it's part of the world. And I … I don't know, I don't know … [pause] It's not just the way that the Kim family is a kind of substitute royal family with mythical aspects, and reincarnating a whole set of actually Japanese values and notions of nationhood. It's sort of sacral or sacred nationhood  divine mother stuff … it's not Communist, it's nothing to do with Communism, Marx. They could never understand Marx  it's not Marxist, it's more Confucian and then Japanese nationalism, but it's very fragile. When that guy goes, they're talking about his son but his son doesn't really have anything going for him. AS: It depends on what the military  if you wait long enough, the crazy old soldiers will all be dead, that's what has to happen, because they're really in command and they're not rational. They're not modern, and in China they've mostly already died but in Korea some of them are still up there. Once they're gone, I think the military establishment might well decide that it's more interesting to be like the Chinese PLA  you know, enjoy elite status and a pretty strong power position and at the same time be able to go and spend your holidays abroad. Whatever, make fortunes. Probably. I don't know. It's going to be a long time, though. This interview was conducted as part of Cordite editor David Prater's Asialink residency in Seoul, sponsored by the Malcolm Robertson Foundation. Images of An Sonjae courtesy of his homepage. David Prater's interview with Ko Un also appears on the Cordite site as part of our EPIC issue. This entry was posted in INTERVIEWS and tagged An Sonjae, David Prater, ko un, Korea, Ozko Features, seoul, translation. Bookmark the permalink.